Ava (5) attended the launch of Narelle’s book, Don’t Let a Spoonbill in the Kitchen, with me earlier in the year. This is a book Ava has come back to time and time again, as children often do when they have a personal connection with a book, such as going to a book launch or hearing an author speak at their school. 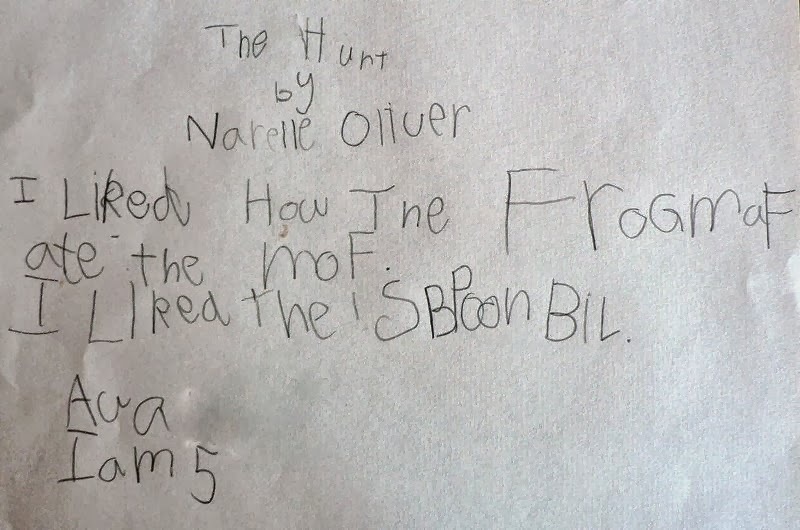 She came across Narelle’s book, The Hunt, recently, and instantly spotted a spoonbill bird in this one as well – she’s pretty convinced that Narelle must put spoonbills in all her books. Ava particularly liked finding the animals and insects hidden in The Hunt. She loves a ‘finding things’ book, as she calls them, and this one is lovely – nothing like a bit of learning about native animals while you have fun finding camouflaged creatures! The Hunt has provided many a quiet half hour while Ava has studied a page, seeking out every creature then checking the back of the book where there is a ‘cheats guide’. 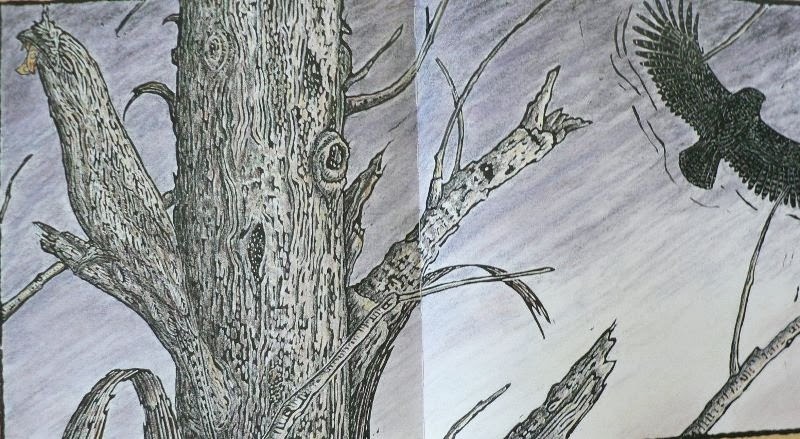 There are so many ways to respond to a book with younger readers, but I think artworks are one of my favourite ways to engage children with a book they have just read and enjoyed. I remembered Narelle had done an activity with the students at my school the last time we had her as a visiting author. 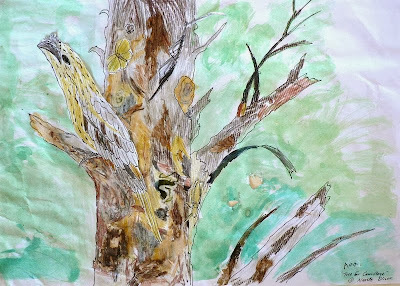 Narelle provided each student with an outline style illustration of one of the pages from The Hunt and demonstrated how to create texture and how to camouflaged the insects and animals. I dug out the activity and Ava greatly enjoyed doing this over a few days in the school holidays. I didn’t intervene in the process except to limit the colours she chose and to show her how you could scratch through crayon layers. We talked about colours of trees, the bush, and nature, and agreed (debated) which colours she would use. 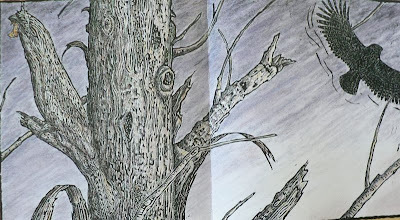 It was a slow process of building up texture, adding detail with black pen, adding some crayon, scratching in the crayon, adding some paperbark, doing a green wash background ‘to cover all the messy bits I made mummy!’ and then adding in the insects and animals. On completion, there was much huffing when she went to write her name at the bottom and saw that in fact Narelle’s was already there – well Narelle had done the original outline! After being convinced to not scrub Narelle’s name out with black pen, she decided to write her name above it. 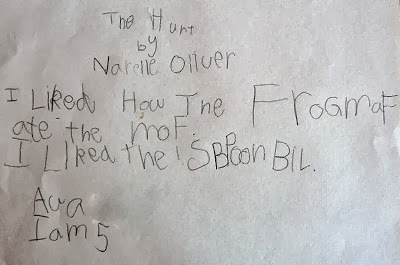 Ava is only just starting to write but she was very keen to write a short review of The Hunt for KBR's Children's Week. She copied the title and Narelle’s name from the front cover then thought about two things she liked from the book. As with all beginning writers, she is terribly frustrated that her writing skills are not able to keep up with her thoughts! But this time she persisted (rather than screwing up the paper in disgust!) and she is just a little bit stoked about her first review (below). Ava is the daughter of Megan Daley, who writes and shares her adoration for children's literature at Children's Books Daily. Simply love your artwork, Ava! What an inspiring post. 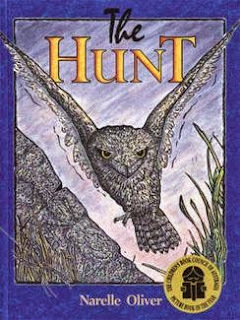 It was really exciting to see your review of my book, The Hunt. I'm always happy when I hear someone has enjoyed reading and looking at one of my books. I'm also glad you liked the bit when the frogmouth caught the moth. I know some readers find that part a bit scary or sad for the moth - but I guess that is nature - and I think the frogmouth would be very pleased to finally catch something after her long hunt. Your artwork really captured the colours and textures of the Australian bush. When I look at your tree it reminds me of a paperbark - and frogmouths camouflage beautifully in those. thank you so much for taking the time to post this. 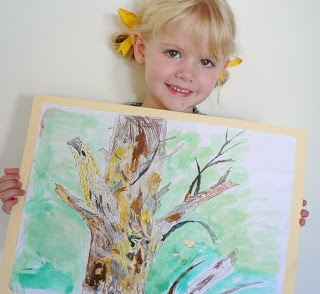 Thank you for your lovely review and for sharing your wonderful artwork, Ava. I haven't read The Hunt yet, but you have inspired me to find a copy very soon.